CNN's Harry Enten takes a look at the razor-thin Senate and gubernatorial races in Florida, as well as the senate race in Arizona. According to unofficial results filed by the counties, Republican Gov. Rick Scott leads incumbent Democratic Sen. Bill Nelson by more than 12,500 votes, or about .15%. The spread in the governor's race is larger, with Republican former Rep. Ron DeSantis ahead of Democratic Tallahassee Mayor Andrew Gillum by nearly 34,000 votes, for a lead of .41%. In the narrowest contest, Democratic agriculture commissioner candidate Nikki Fried's advantage stands at 5,326 votes — just .06% — over Republican Matt Caldwell. As the counting continues, the biggest daily developments in this story will likely be the flurry of lawsuits that can and will be filed from all the campaigns. There will be a pattern. Republican lawsuits will be designed to preserve the vote totals as they currently exist, the Democrat ones will be designed to expand the pool of available votes. That is not a good vs. evil comparison. It is a one side is winning vs. one side is losing comparison. 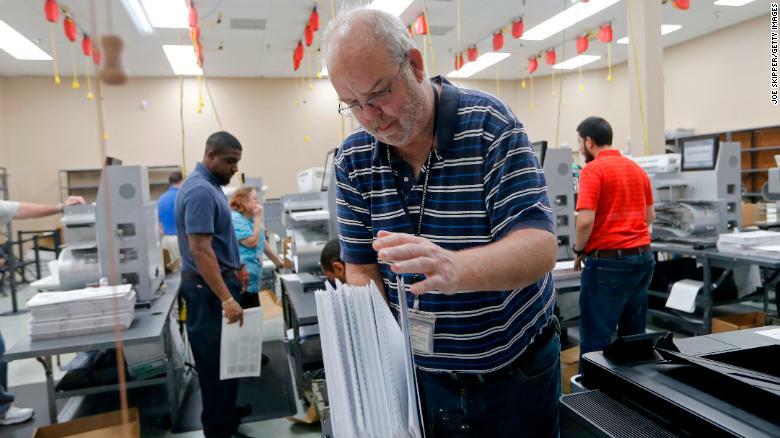 Among the ones to expect: a lawsuit of some kind to allow Palm Beach County to extend their recount beyond the Thursday deadline (Read: CNN's Gregory Krieg's piece on the deadline here). And could Gillum, who has yet to sue anyone, finally join the fray and either file a suit on his own, or join an existing legal battle? These lawsuits are expensive, important and do offer up the possibility of having a tangible impact on the vote count. That impact may not be nearly as important as what it does for the public relations battle both sides are playing. Case in point: Scott's two successful lawsuits against Palm Beach and Broward County. They had no real impact on the vote total, but it does allow the Scott team to respond that both County Elections Supervisors were found to be "violating the Constitution" whenever anyone asks them to point to real evidence of fraud. Those cases had nothing to do with fraud. It was about releasing records that were eventually going to be released, but just a bit early. However, it certainly makes for a powerful talking point. You will continue to see Scott's team use strong language to describe Nelson's role in this. "Fraud" & "Steal" will be a constant refrain. The Nelson team will continue to paint Scott as someone willfully attempting to prevent valid votes from being cast -- and even using his powers as governor to do so. (Democrats compared him to a socialist dictator Sunday night). To keep an eye on: Will Scott go to DC next week for a photo-op with Senate Majority Leader Mitch McConnell Photo Op? His team says it is still being "considered." As for the gubernatorial candidates, expect DeSantis to attempt to be as far above the fray as possible. If he does anything (and we don't think he will), it will all be in a role as governor-elect. He knows his chances of losing are slim, and he has the restraint to not get in the way of things. Gillum has already made two high-profile public appearances with another one scheduled for Monday night. He is expected to make several more in the coming days. He will give a speech in Boyton Beach Monday night. This is largely to capture the captive national audience. They remain realistic (or clear-eyed) about the eventual outcome. His is of course, in search of a new job. It is NOT easy to recount 8.5 million votes in this short of a window. A lot could go wrong. Already we've seen longer than expected periods of time to sort ballots and calibrate machines. Some counties will have no issues, others will struggle. There is also the chance that bins of ballots could go missing or machines could fry. All of those issues are on the table. Remember, none of that matters in the eyes of Florida law. The recount must be done by Thursday at 8 p.m. ET or the Saturday count stands. Why is Florida so bad at this? Didn't they figure this out after what happened 18 years ago? Some context here. First, Florida did fix these problems since 2000. The state overhauled its ballot process and machines, it set finite timelines for the completion of these tasks and made the recount laws clear and specific. But these laws were written when the expected pool of voters in Florida was around the 5 million mark. This election was at 8.5 million. It is a lot quicker and easier to recount 5 million votes than it is 8.5 million. Second, this was an extraordinarily close election. And there were three of these extraordinarily close elections. This is a perfect storm of difficulty and one even the best-run election systems would have a hard time with. Honestly, so far, despite the hyperbole and a few minor hiccups, this one has not really been that bad. Wednesday's hearing in Federal Court in Tallahassee where a new judge will hear the case regarding the adjudication of provisional and mail in ballots. The best guess as to how many of these ballots are at stake is around 20,000. Daniel Smith, a University of Florida Research Foundation professor in political science and a data junkie, has a terrific thread on these ballots and where they come from. His research shows why Democrats are so keen on getting these votes counted. They disproportionately come from minority and younger communities -- communities that vote overwhelmingly Democratic. Mark Elias, the Democrats' lead attorney, has consistently said, the more those votes get counted, the better it is for his clients. One thing to be aware of: the new judge in this case, Mark Walker, has previously ruled on a case like this, but he is not considered to be a fan of Scott. There is a sense among the campaigns that this case could go all the way to the U.S. Supreme Court. Sunday night, the judge issued guidance for the hearing, subpoenaing two elections officials to talk about the specifics of the process on Wednesday.